How to Choose Right Travel Charger Adapter? Experienced travellers know how important travel adapters are during an international travel. No matter where you go, you’ll find your bag or luggage is filled with electronic devices, including cellphones, cameras, iPads, tablets, etc. But you can’t give up any of them to ensure a happy journey. How to keep all these gears on the go when traveling is a problem that you must take into consideration. There are many types of travel charger adapters for your option, such travel power strip, travel plug adapter, power converter, etc. Which to choose should be based on your real needs. Plan to travel in other countries? Don’t forget to take plug adapters. At present, different country has different plug types, including EU plug, AU plug, US plug, UK plug, etc. You may have prepared for a 100V~220V power charger in your travel bag, only to find that all things go wrong because the wall outlet in the hotel can’t fir for your power charger at all! Travel adapter is such a device that can let you use a suitable local plug type easily by connecting your power charger to it. You can find different plug types for different countries in market now. But it is critical to know that plug adapters don’t convert voltages, so make sure your electronic devices like cellphones, tablets, plugged into this adapter then into the wall outlet can work on the voltage of the country you’re visiting. Before you choose a suitable plug adapter, you must know which country you want to go and what devices you want to charger. To avoid this embarrassing situation, you can try a universal plug adapter or a full pack of plug adapters. No matter where you go, you can find the right plug type. Include Type 3C for China, Type FR for France, Type UK for UK, Type JP for Japan/USA, Type IN for India, Type BR for Brazil, Type IS for Israel, and Type IT for Italy. 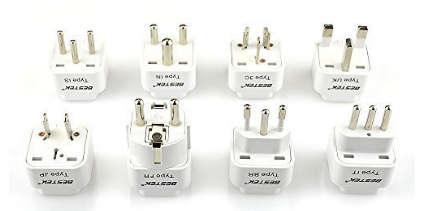 Accepts all types of connectors: 2-Prong US "polarized", 3-Prong US grounded, European, UK, AUS and India plug standards, except for the large South African plug). Metal interfaces ensure good conductivity to charge devices faster. Note: you should take a suitable charger that can accept the local voltage. For example, if your electronic device can be only used with 220V, but you’re in a 110V country, then you should change a power charger or get a voltage converter. If the devices say “110~240V input”, then it can handle the increased voltage and you can use the adapter. With a power converter, feel free to use the electronics you take. Different countries have their own plug types as well as their own standard voltages. Sometimes you may have taken a plug adapter when traveling in another country, but you still can’t use the local power to charge your devices. Why? That is because your electronic devices can’t go with the country’s local voltage. Worldwide voltage ranges from 100V to 240V. If you’re from USA and want to use US 110V devices in China whose standard voltage is 220V, then you need a voltage converter to transfer the 220V into 110V for your devices, or your devices may be damaged. Power converter is an electronic device that can transfer one voltage standard into another useful standard voltage. You can find 220V to 110V power converter and 110V to 220~240V power converter. Which one to buy depends on where you’ll go and what kinds of devices you want to use. Convert all countries’ voltage to 110V, you can charge any US devices safely as you like. Comes with three AC outlets and four USB ports, allowing you to charge up to 7 devices simultaneously. Compact designed, easy to take and use. 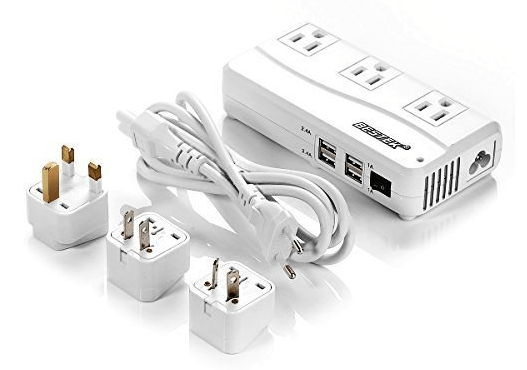 Includes three travel plug adapters, you can use it in over 150 countries all over the world. NRTL certified and top quality ensures complete protections for your devices. If you have many USB devices, a multi-USB travel adapter couldn’t better for you. With more and more mobile devices coming out in the market, everyone has two or three USB devices. Cellphones, cameras, iPads, selfie stick, and other USB devices as you like. Power banks can’t meet all your charging needs anymore. 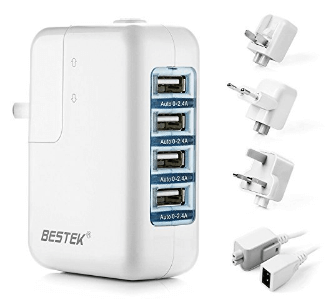 So a multi-USB charger is the perfect for those who have many USB devices to use when traveling. All USB ports are intelligent identified that can detect your devices and tailor the optimal charging current for each device from 0~2.4A, to charge 75% faster than ever. Accepts 100V to 220V international voltage and comes with US/EU/UK plug adapters, enabling you to travel all over the world. Fully protect your devices from damages against overloading, overcurrent, overheating. To charge both appliances and USB devices, a travel power strip is better for you. Sometimes you may also need to use laptops or other appliances that need AC power apart from USB devices. Then you’d better choose a power strip. A USB power strip can allow you to charge appliances and USB electronics at the same time. But choose a power strip that is portable and offers you enough outlets. 2 AC outlets and 5 USB ports, allow you to charge cellphones and laptops at the same time. USB ports provide 8A 40W output to fast charge your iPad, tablet, Android devices or iPhones. Extra 8 plug adapters and workable with worldwide 110V to 2520V voltage, you can use it in almost any country. 1700J surge protection to protect your devices from power surges or spikes. Built-in full protections to safeguard your devices against overloading, overcurrent, overheating, short-circuit, etc. Feel it too bulky to take plug adapters or converters? 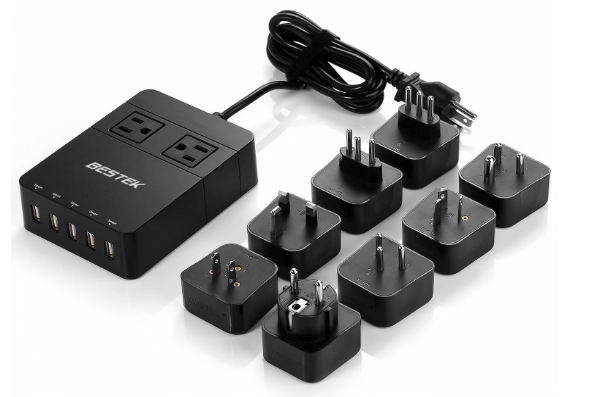 Try the all-in-one travel adapter. As mentioned above, to use your electronic devices smoothly and safely, you need to consider the country’s plug types and standard voltage at the same time. If you want to have a worldwide travel, you need to prepare for all kinds of plug types and even voltage converters. But it is rather bulky to take so many devices. To have a relaxing travel, you can just take a universal travel adapter. 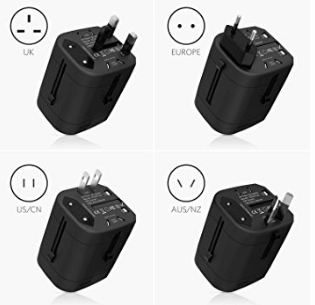 The universal travel adapter may contain the outlets and USB ports you need, has the right plug adapters you need and accept worldwide voltages. 1 universal AC outlet and dual USB ports, allow you to charge multiple devices at the same time. The AC outlet is interchangeable to be 2 or 3 prong plug, allow for AUS/EU/UK/US devices, allow for traveling all over the world. Can charge any 220V-1320W/110V-660W devices, like cellphones, cameras, MP3 players, GPS, laptops, etc. Smart USB can detect and deliver the fastest current for each device automatically. Reliable quality with FCC, CE and RoHS certified. Environmentally-friendly with PC shell and fire-resistant with UL94V-0 materials. Due to the difference in plug types and voltages between countries, travel adapters are one of the indispensible devices for you when you travel in other countries. A suitable travel charger adapter can keep you gears always on the go and ensure you a happier travel experience. Which one do you prepare? Choose one before you go based on your real needs. 30 Free Gifts & over $1000 Savings - Scary Halloween Treats for You!